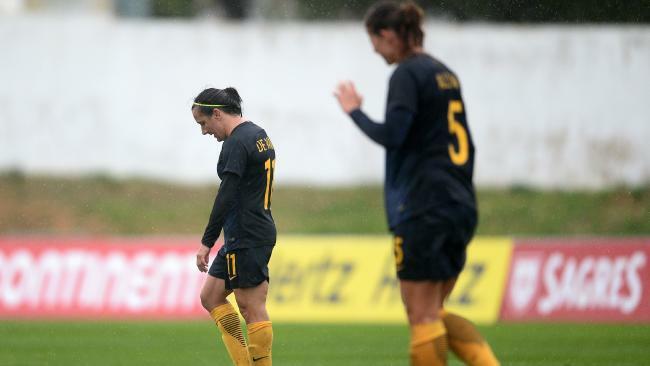 THE Matildas have ended a mixed Algarve Cup campaign with a whimper, falling 2-1 to Portugal in their third-place play-off. Australia couldn't do it on a wet, windy Wednesday in Albufeira, lacking their usual panache and missing a penalty to place fourth in the invitational tournament and hand the world No.38 host nation its highest-ever finish. Caitlin Cooper coughed up Australia's first goal before netting the equaliser in first-half stoppage-time. But in the end, Vanessa Marques' crackling long-range strike settled the sides' second meeting in five days following on Saturday's 0-0 draw. Having topped their group but fallen short of the final on goal difference, Australia went out to recreate the energy of last week's thrilling 4-3 opening win over Norway. As promised, coach Alen Stajcic made mass changes from Tuesday's 2-0 win over China, rotating seven of his starting XI to share around the minutes before next month's World Cup qualifiers in Jordan. It yielded little in the opening 37 minutes - bar an Elise Kellond-Knight free kick that rattled the post. By the 38th they were behind as Cooper's poor back pass sold Lydia Williams well short. Nadia Gomes made the Matildas pay, intercepting and circumventing the onrushing goalkeeper to roll the ball into the corner. Cooper atoned on the stroke of halftime, heading in Kellond Knight's free kick at the back post to restore parity. But the Matildas found themselves back under immediate pressure, and how Diana Silva did not reinstate Portugal's lead after the break was anyone's guess, the winger missing an open goal after Williams came off her line to halt Jessica Silva's run. Five minutes later the hosts had their second goal and there was little Williams could do against Marques' venomous shot from distance. Portugal continued to pepper Australia's goal and it was through their own profligacy their lead was not extended. Stajcic brought on Sam Kerr in search of another equaliser and they were handed a slice of luck when Silvia Rebelo brought the star down in the box. 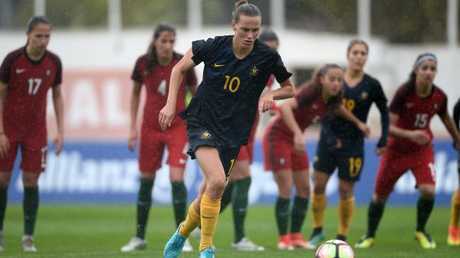 Yet even the penalty didn't play in the Matildas' favour, and Emily van Egmond's spot kick was aptly saved by 18-year-old goalkeeper Ines Pereira.